With the holiday season right around the corner, many people are dusting off their china sets in anticipation of celebrations. If you’re going to be playing host, it’s important to make sure your table is decked out appropriately. Looking to try something new? 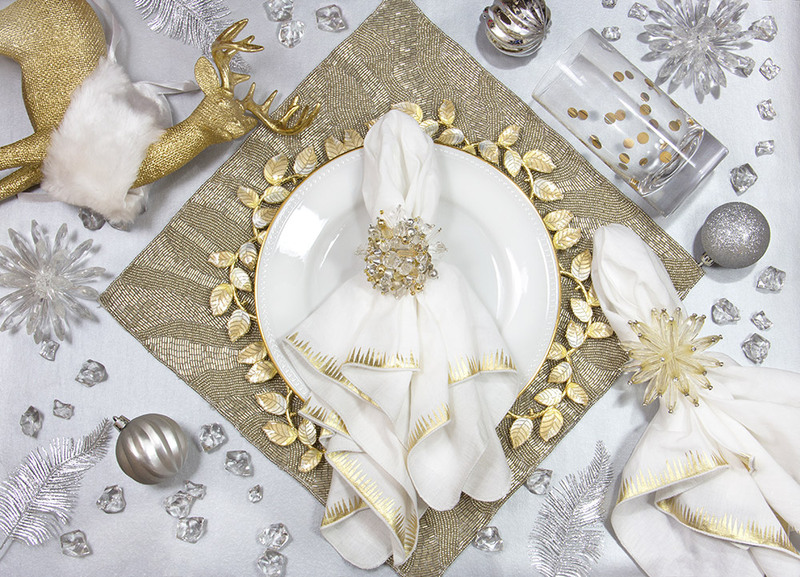 Impress your guests with inspiration from our festive tablescapes below, designed using products from Pioneer Linens. 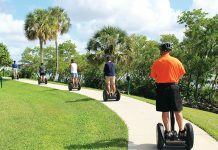 Just because our trees don’t turn color in Southwest Florida doesn’t mean we can’t partake in the traditional themes of autumn. With shades of red, orange, gold, and brown, this design celebrates the best of harvest hues and is perfect for Thanksgiving or simply keeping your dining table festive throughout the fall. The Look: Layer the gold Samarcanda charger ($132) and white dinner plate on top of a red beaded placemat ($45) for your main attraction. 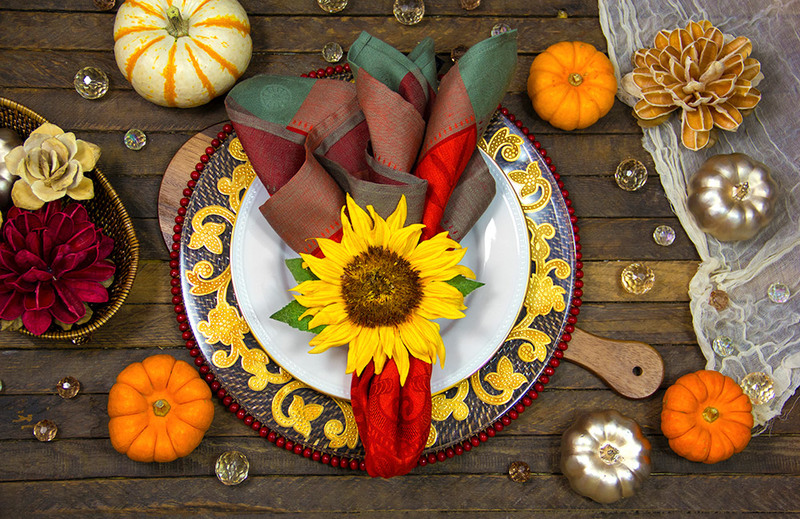 The bright sunflower napkin ring ($32) will provide a pop of color in an otherwise earthy theme. Fill a wicker bread basket ($32) with some fall foliage and finally, make sure to pick up a couple miniature pumpkins to mix with their metallic counterparts. 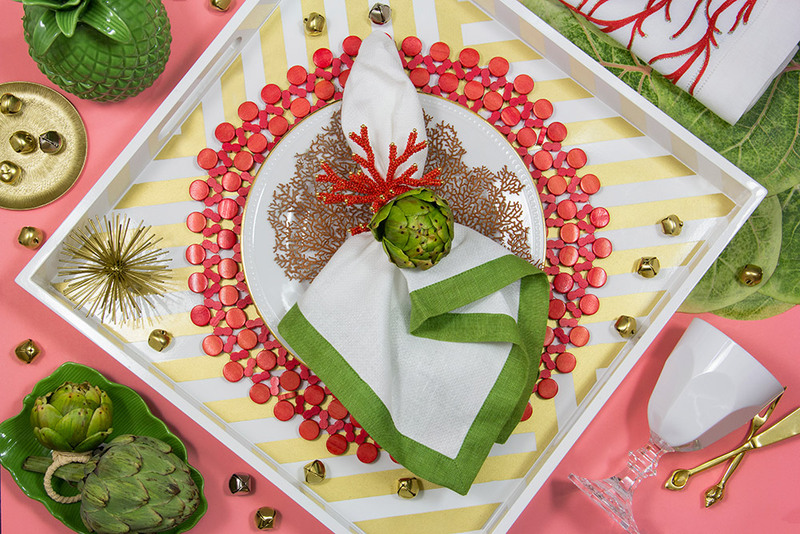 Perfect for spring and summer parties as well, this versatile coral and lime tablescape can also be construed as a tropical take on the traditional red-and-green Christmas combination. 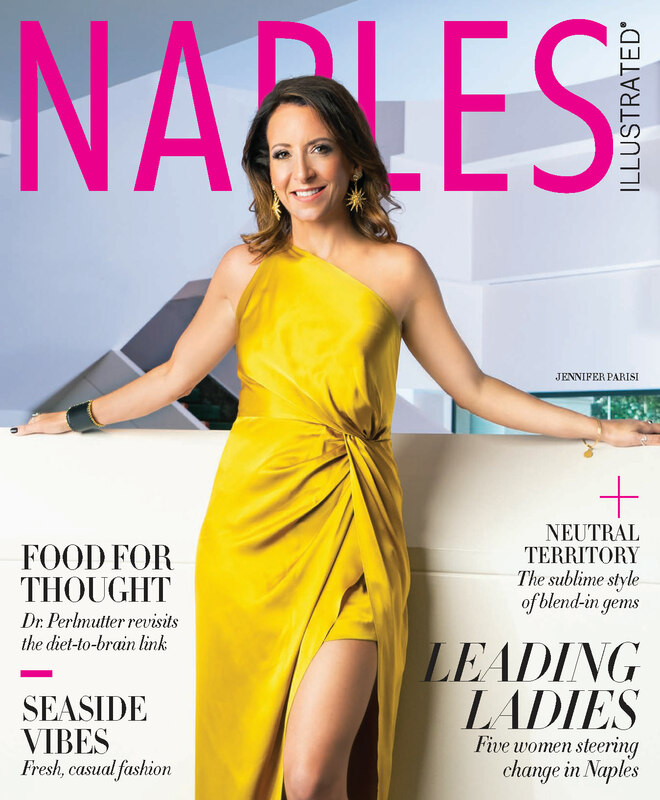 The Look: The bright colors of Lilly Pulitzer were born in Palm Beach, and this design honors those vibrant hues with its bright white and colorful coral theme. 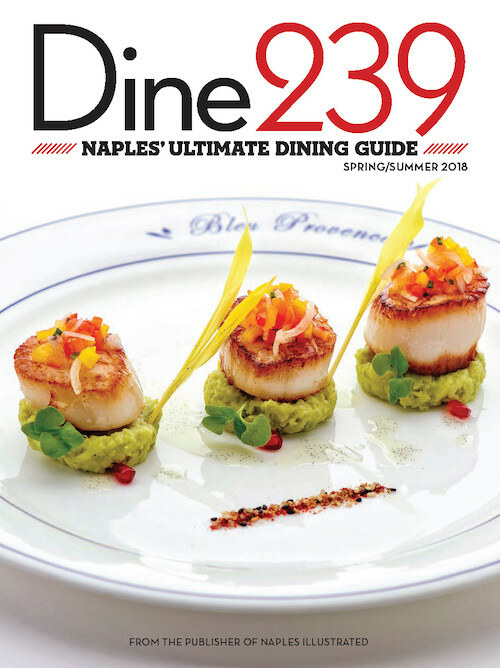 The green pineapple jar ($40), banana leaf dish ($10), and artichoke napkin rings ($28) keep Florida’s rich foliage in mind while the bamboo placemat ($21) and whimsical coral branch ($24) lighten the mood. For an added holiday touch, sprinkle some gold jingle bells around the setting. It wouldn’t be an authentic Florida design roundup if we forgot to include a blue-and-white setting. 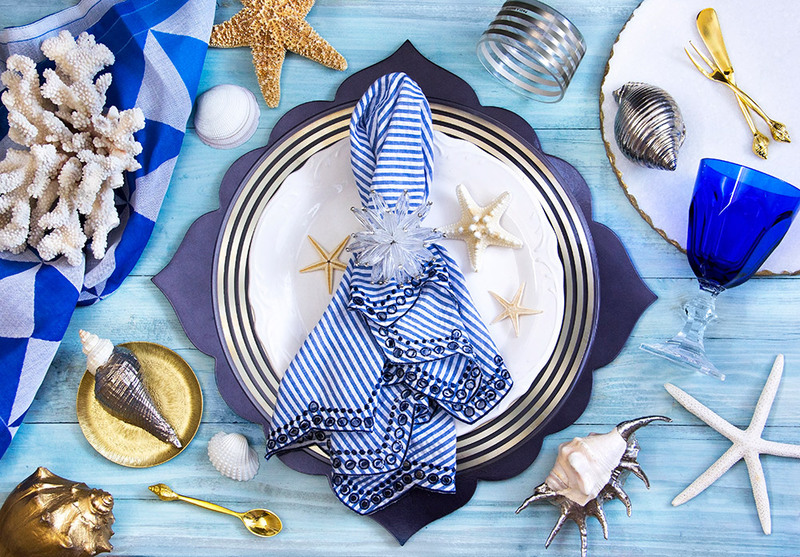 The majority of people living in Southwest Florida boast coastal or nautical-themed home decor, and this oceanic composition can not only be used to keep your table pretty all year round, but can easily be tweaked for a Hanukkah celebration. The Look: The jewel-bright tone of the Dolce Vita water goblet ($24) pairs perfectly with the blue origami napkin ($18), while the Sottopiatto charger ($95), silver bowl ($29), and navy seersucker napkin ($26) provide the classic nautical stripes. For a finishing touch, add in a few shells such as this gold-painted volute ($35) or silver-edged spider conch ($61) to go along with the accompanying gold shell serving set ($30). We may not have sparkling icicles hanging from our rooftops or snowy white drifts adorning our lawns during the winter, but this gold and silver tablescape with its beautiful metallic hues and clever use of crystals will make you think we do. 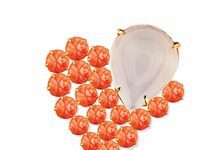 The Look: This gold and silver laurel charger ($135) topped with a delicate white Aura napkin ($30) and accompanying crystal dome napkin ring ($21) makes for an elegant Christmas setting. Dress it up with some silver ornaments, ice crystals, and an adorable gold reindeer complete with fur scarf.